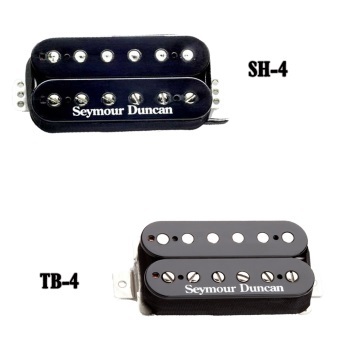 The archetype hot-rodded humbucker for over 35 years. Great for everything from heavy blues to heavy metal. The world's most popular humbucker. Provides slammin' output while retaining singing highs, aggressive harmonics, and just the right blend of sustain and distortion. Goes from sweet warm tones to raw rock 'n' roll. Compared to the SH-14 Custom 5, the JB has a stronger treble detail. Some players use it with 250K pots to smooth out the highs. Comes with four-conductor hookup cable. Recommended for bridge position. Often a JB is paired with a neck pickup like the SH-2n Jazz (Seymour's favorite) for versatility or a SH-1 '59 for P.A.F. tones. For balanced and warm instruments. Works especially well with rosewood fingerboards. Nickel or gold-plated cover. Trembucker. 7-string version. Available in matched set of SH-4 JB Model bridge and SH-2n Jazz Model neck.Colors (humbucker spacing).